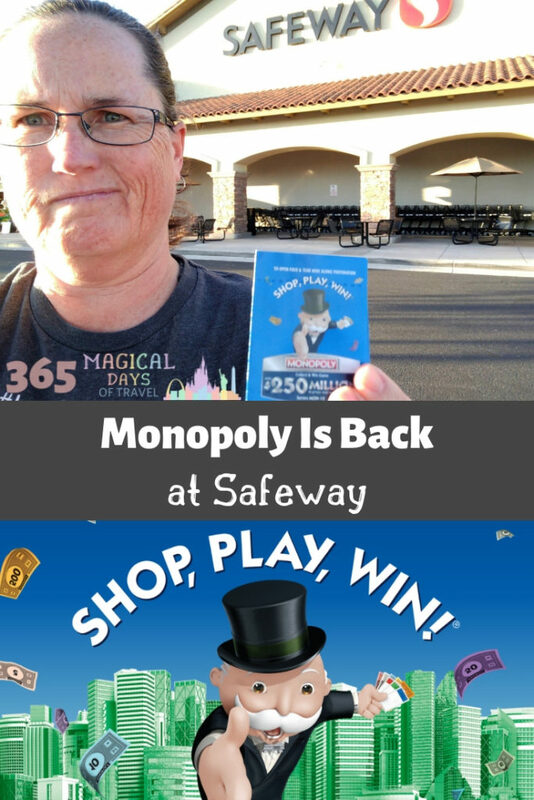 I have a love-hate relationship with the Monopoly game from Safeway. While it’s fun to collect the tickets and earn free stuff, it is really tedious and goes way too long. When I got to my folks’ house the other day and saw the tickets that my dad had collected waiting for me, I groaned and said, “Monopoly? Already? !” I know it goes all the way until May, and we’re not even halfway through February. Ugh! However, I am looking forward to all of the free stuff. We collected free bags, magnets, and photo books from Shutterfly. We saw a free movie through Fandango. We were able to redeem a good number of free grocery items from Safeway. And this is the reason to do it! So the Monopoly games works like this. When you check out at Safeway (or whatever your local affiliate is, see the chart below), the cashier will count out the number of game cards that you earned for your transaction. Go ahead and pick up a game board the first time you play at the check out. The game cards are divided into two pieces. 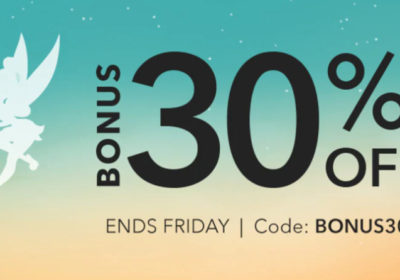 One half contains either a coupon or code to enter online. The other half has the game board markers, which are your entries into the sweepstakes for a whole host of prizes, from a $5 cash all the way up to $1 million. In order to play the game online, you first have to sign in with your local store affiliate and account. That way, all of your winning grocery codes will be automatically loaded into your grocery store rewards account. 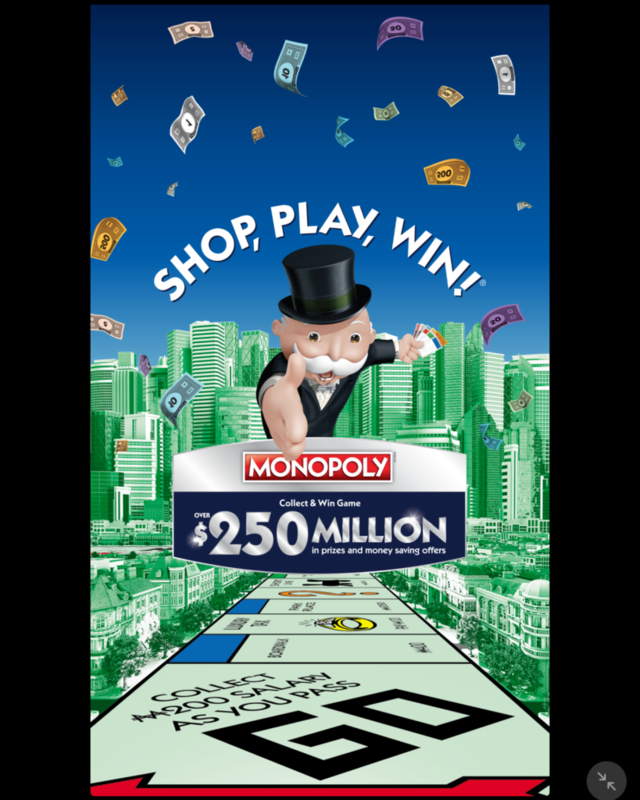 You can enter codes online here, but the app will make your life so much easier when playing Monopoly. 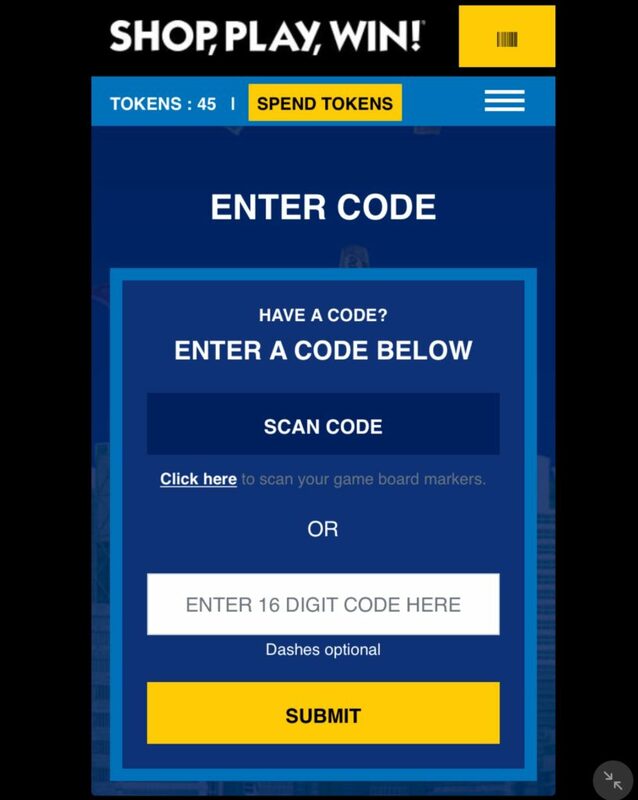 Instead of hunting on your game board for pieces, the app will keep track of the game pieces you already have and will let you know which are duplicates for each game piece when you scan the QR code on the back. Even better, the app has a section to scan the barcode on the other half of each game card. 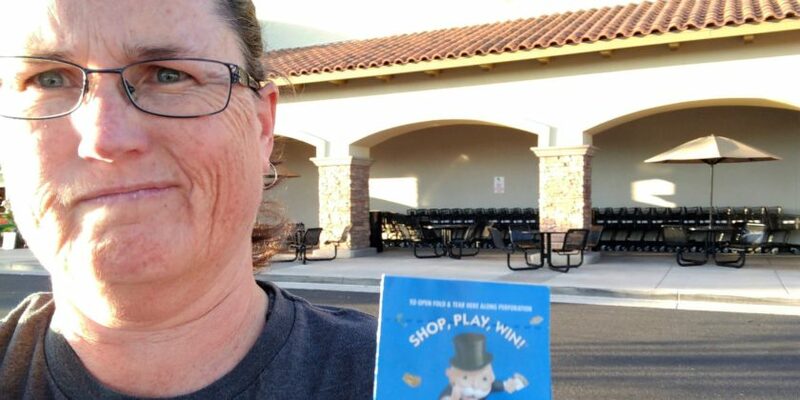 Some game cards come printed with their prizes, like coupons, free products, or bonus Box Tops for Education, but most game cards will simply have a barcode. You scan it into the app or type the code in online to find out what the prize is. So far we’ve gotten free products, coupons, bonus Box Tops, and tokens on these cards. The game had tokens last year, but they weren’t as lucrative as this year. 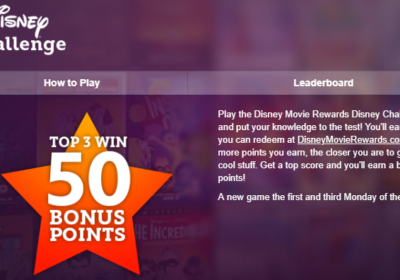 Last year, the tokens were broken down into different categories, like Fandango, fuel rewards, and sweepstakes entries. This year, they are all lumped together with free gift cards and products. 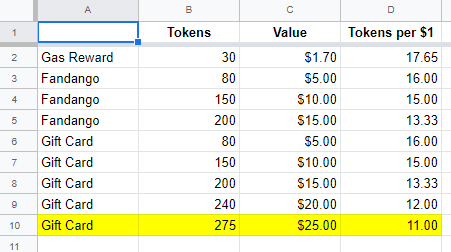 I made a quick spreadsheet of the value of redemptions, and the best one is the $25 gift card for 275 tokens. Of course, if you don’t earn that many tokens, you may not reach 275, but it’s a good goal, and you can always use any leftovers for lower value prizes. We earned 31 tokens just with our first few cards, so it’s definitely achievable. I already wasted several tokens on sweepstakes since I hadn’t scrolled all the way down at first to see the good redemptions. Lesson learned. I really raked in a good haul from Shutterfly last year, and have a great conversation piece whenever I use my bags at the Safeway check out line, but I haven’t seen any prizes from Shutterfly so far. However, one look at the Prizes tab on the app, and you can scroll through all of the winning spin combinations, from $100,000 cash to free products or coupons. 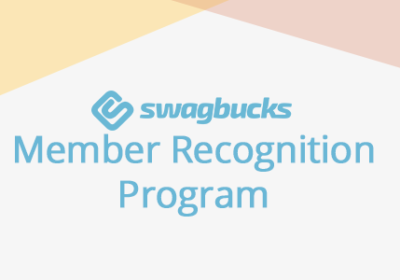 Sure enough, this is where you can instantly win Shutterfly products, more Fandango codes, free bowling, and Starbucks gift cards, among others. It’s quite a lineup! Last year, I was over at my friend’s house, and she was using the printed coupons that came with the game cards, but wasn’t scanning or entering codes. My dad gives me all of his game cards because he doesn’t want to bother with the game at all, but knows that I play. You definitely have to play to your own comfort level with this game, given its complexity. Do make sure that you are redeeming as you go, because stores start to run out of the free products and game pieces toward the end. I’ve even had cashiers give me huge stacks of game cards because they are tired of counting them out and hope they run out sooner rather than later.